Welcome to Week Ten of our series showcasing the world-class Glove Collection of the Worshipful Company of the Glovers of London, cared for and housed at the Fashion Museum in Bath. This week we’ve chosen something slightly different: rather than a pair of gloves, this week’s Glove Story of the Week centres on an artwork that features just one single signature glove. The white leather decorated gauntlet is nestled on a cushion of red silk, in its own fabric-covered presentation box. The work is called ‘et ne nos inducas… (and lead us not…)’, 1987-89, by Rozanne Hawksley. 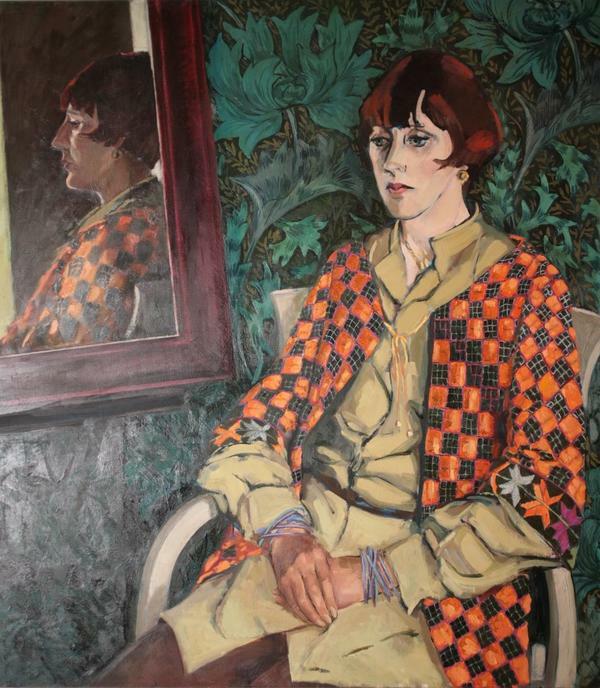 Artist Rozanne Hawksley (b.1931) is known as one of the UK’s great textile art innovators. Famously, one of the leading figures in the Subversive Stitch, the exhibition at Manchester’s Cornerhouse Gallery in 1988, Rozanne’s work has often incorporated used and worn gloves. Now, for the first time, many of these signature artworks featuring gloves have been brought together in one place and displayed at the Fashion Museum, as part of Glove Stories. We are delighted too to announce here that ‘et ne inducas … (and lead us not…) will become part of the Glove Collection of the Worshipful Company of Glovers of London, generously gifted by the artist. 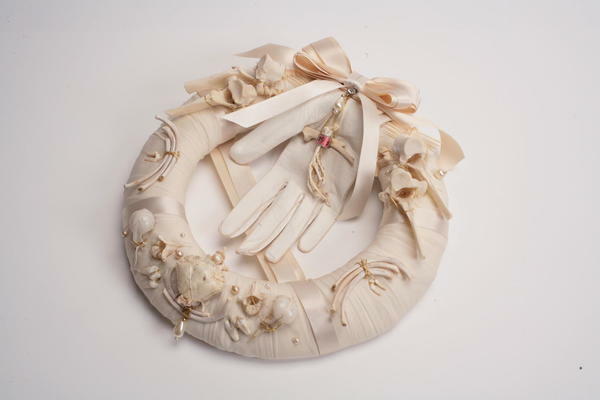 It was at the Fashion Museum in the 1980s, then known as the Museum of Costume, Bath, that Rozanne first came across the Glove Collection of the Worshipful Company of Glovers of London. Rozanne was visiting with her husband Brian and was struck by the beauty and intricacy of the embroidered 17th century gloves on display; she commented only recently: “It was at Bath that my eyes were opened”. This visit informed her artistic practise and ‘et ne inducas … (and lead us not…) was one of a series of works directly inspired by what she saw at the Museum that day. This artwork shows many of the hallmarks of a 17th century gauntlet glove. 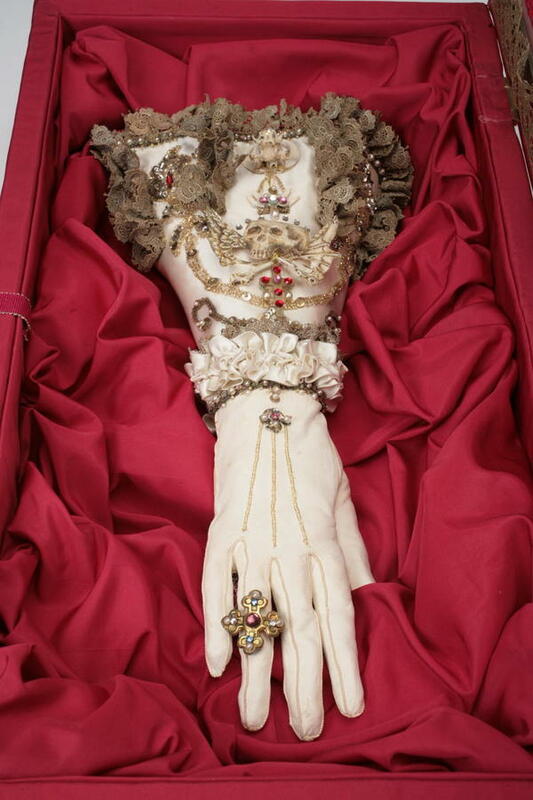 The leather glove is decorated on the back with pastes and jewels, there is a ruched ribbon at the wrist, and the gauntlet cuff is outlined with a deep border of lace, to give a ‘stand up’ effect. The raised and figurative embellishment on the cuff is similar in spirit to Jacobean ornamentation, but the materials and treatment are subtly different. 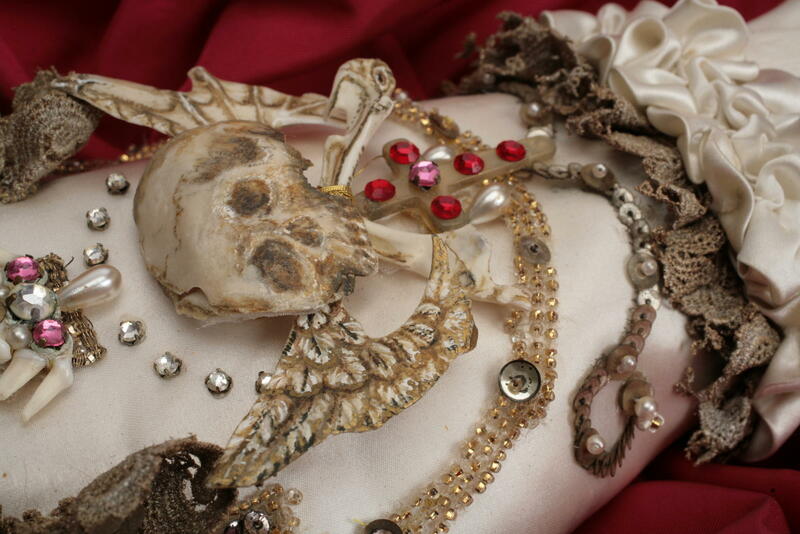 Instead of dense metal thread embroidery and designs showing exotic birds and beasts, Rozanne uses delicate bird and animal bones to create patterns, including a winged painted skull. 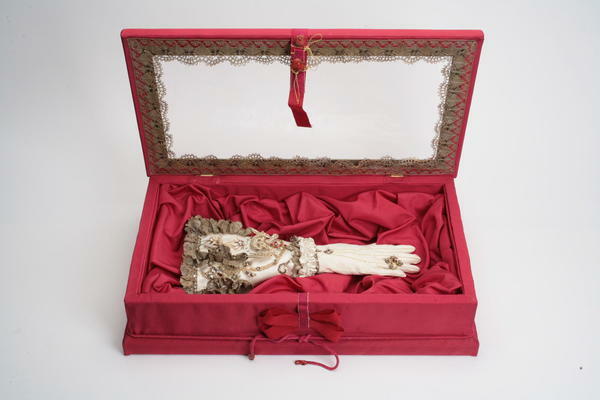 The jewelled glove-in-the-box does display a Baroque sensibility, as characterised by art historian Stephen Calloway: ‘…the richness and exquisite detailing, with the kind of programmatic meaning so beloved by seventeenth-century makers and their cultivated patrons’. And Rozanne’s work does have implicit meaning, addressing universal themes of love and loss, mourning and remembrance, but situating those darker moments within the continuity of life. 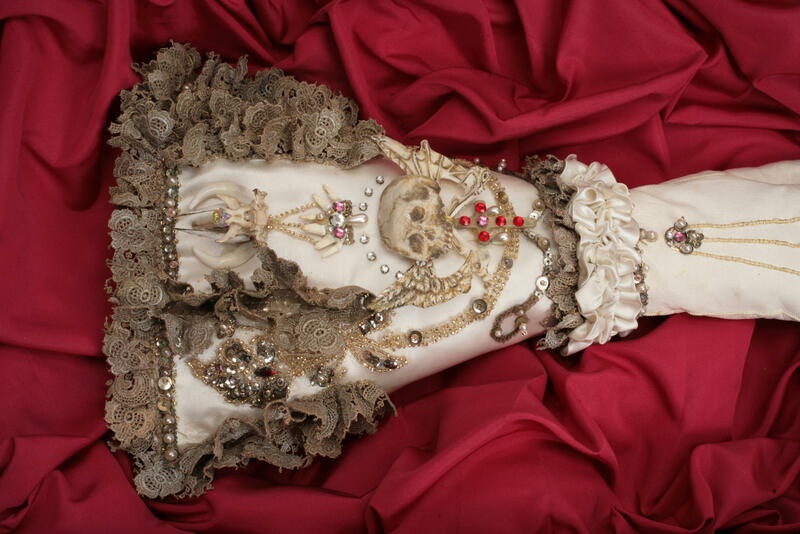 Philip Hughes, Director of the Ruthin Craft Centre, and a long-time supporter of Rozanne Hawksley’s work, summed this up: “There is a fascination with revealing the darker, macabre even, side of existence, with re-interpreting centuries-old memento mori, but within a unique and life-affirming embrace”. There are 15 of Rozanne Hawksley’s artworks incorporating gloves, including ‘et ne nos inducas … (and lead us not…) on display at the Fashion Museum. Rozanne can be seen here talking about her life and her work, and her lifelong fascination with gloves, which started way back in childhood and has been a constant throughout her working life. 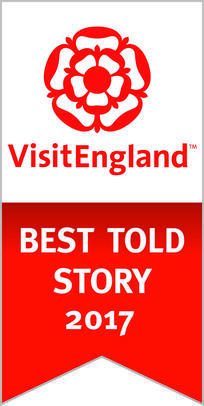 We are delighted to share Rozanne’s Hawksley’s ‘glove works’ in Glove Stories. 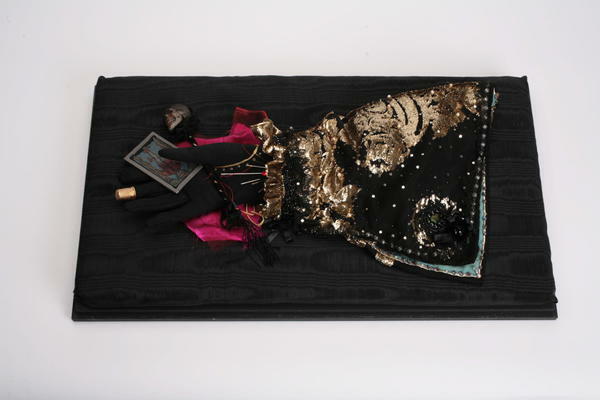 Glove Stories is on display at the Fashion Museum Bath until 1 March 2020. To celebrate we are highlighting one fabulous pair of gloves, a single glove, or a glove-related object, from this wonderful collection every week.